This South Wales band first played together at Christmas 1966 though all had experience with other bands previously. They had been disappointed with their hitherto lack of success and descended on London early in 1967. They proved to be a popular stage act and were given the chance to record with Decca's new offshoot, Deram. Their first four singles for the label all reached healthy chart positions, but after some management dispute the group defected to Andrew Oldham's 'Immediate' where they immediately achieved a #1 with '(If Paradise Is) Half As Nice'. The group split up shortly after the release of their final hit single and the promise of future reconstitution finally faded. Andy Fairweather-Low, Blue Weaver, Clive Taylor and Neil Jones formed 'Fairweather' before Andy found fame as a solo artist. Weaver became part of 'Wynder K. Frog' before moving into the 'Strawbs'. Andy Fairweather-Low has long since become a veteran of the Eric Clapton band. The fact that the legendary guitarist only gathers great musicians about him speaks volumes about the quality of Fairweather-Low's expertise on the guitar. 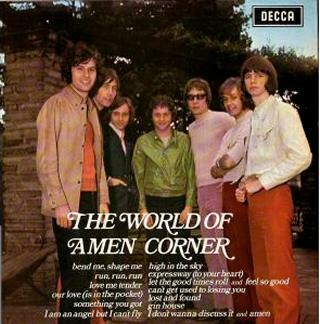 Sadly, most of Amen Corner's output was on record labels that didn't tend to issue many EPs. So if you want something in a nice shiny picture sleeve then you'll have to settle for a 12inch album like the one shown here. The only good thing about this is that it means I don't have to spend much time writing up their EP discography!